Buy direct from Deutsche Bahn, no booking fee, print your own ticket. Comfortable air-conditioned InterCity trains with bistro car link Amsterdam Centraal & Berlin Hbf every two hours, city centre to city centre in a leisurely 6h22 with fares from €39.90 - a soulless flight will take the best part of 5 hours, cost more and be far less relaxing. The train is the way to go, look what you'll see on the way. 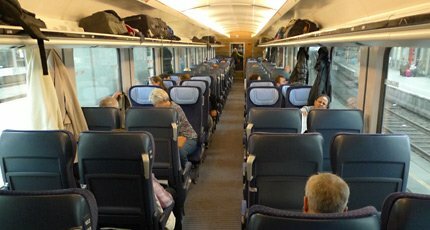 The Man in Seat 61 says "These InterCity trains are spacious, quiet and smooth-riding, and they reach 200 km/h (125 mph) on the new fast line between Hanover and Berlin. 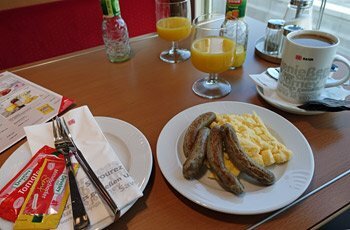 Lingering over a meal and a beer or two in the bistro car is a treat - I heartily recommend the Erdinger weissbier!" What's the journey like? Things to see on the way! Treat these times as approximate and check times for your date of travel at www.bahn.de. 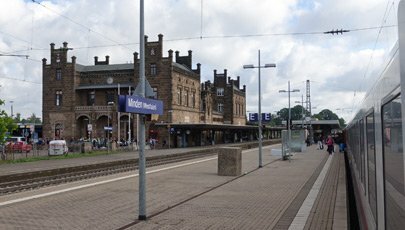 These trains also call at Amersfoort, Deventer, Hengelo, Osnabruck, Hannover & several other stations. There are periods this year when the train won't run between Berlin Hbf & Berlin Ostbahnhof. * = Runs on Mondays-Saturdays between 19 April & 31 August 2019. ** = Change trains at Hannover, arrive 06:18, depart 06:40. Cheap advance-purchase sparpreis fares between Amsterdam & Berlin start at just €39.90 each way in 2nd class or €69.90 in 1st class. These are only valid on the specific train you book, limited refunds, no changes to travel plans. The flexible fare, bought on the day and valid on any train that day, is around €124 each way in 2nd class, so book ahead! Buy tickets direct from German Railways at www.bahn.de (on a mobile device, use this link). You print your own ticket on A4 paper (U.S. Letter size is fine) or simply show the ticket on your smartphone. Booking usually opens 92 days ahead, book early for the best prices. 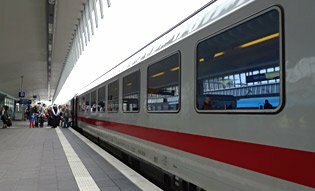 Look for the direct IC trains with 0 changes, although it can be faster to change trains at Hannover onto a high-speed ICE, it's better to stick with a direct train. I recommend registering when prompted, as you can then log in at any time to check or re-print your tickets. The cheap Sparpreis advance-purchase fares from €39.90 upwards are valid only on the specific train you book, limited refunds, no changes to travel plans. The full-flex standard price is around €124 and is good for any train that day. Seat reservation is optional, for a small extra charge of around €4.50, see the travel tips below. If you don't reserve a seat you can simply sit where you like, there are usually hundreds of empty unreserved seats, especially if you are boarding at the train's starting station rather than at an intermediate stop. In the unlikely event you have any problems using bahn.de, www.loco2.com or www.trainline.eu can also sell these tickets at exactly the same prices, the same print-at-home tickets and no booking fee as they have a direct connection to DB's ticketing system. Note that other train ticket retailers (including some very well-known ones) don't have a connection to DB's system and can therefore only sell the expensive full-flex rate, they cannot sell these cheap Sparpreis tickets. If all you see is expensive £100+, €124+, $165 tickets, you're in the wrong place! Clever tip 2: If you don't see any cheap fares at www.bahn.de, for example when booking at relatively short notice or on a busy day or date, here's a clever trick which can often reduce the cost. Go to Czech Railways www.cd.cz and book from Amsterdam to Prague (if you want Amsterdam to Berlin) or from Prague to Amsterdam (if you want Berlin to Amsterdam), first clicking More options then Travel via and entering Berlin as a via station. 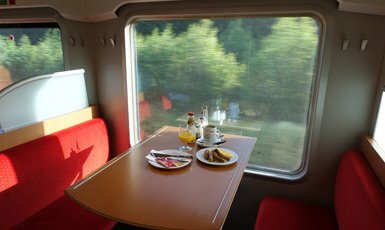 For example, on a busy Sunday afternoon booking only a week ahead, bahn.de had no sparpreis fares available at all on one afternoon train from Berlin to Amsterdam and wanted over €109 on another. The Czech Railways site had tickets available from Prague to Amsterdam for only €61 which included that first afternoon Berlin-Amsterdam train as part of the journey. Buy, print out your ticket and travel! It is perfectly legitimate to use only the Berlin-Amsterdam part of a Prague-Amsterdam ticket and there are no problems doing this - German conductors are able to scan Czech ticket barcodes. Well worth knowing! Click for larger map. Red = high-speed lines. Green = scenic sections of line. Black = conventional lines. Reproduced from the European Rail Map with kind permission of the European Rail Timetable people. I recommend buying a copy of the European Rail Map for your travels, www.europeanrailtimetable.eu with shipping worldwide. Amsterdam... The historic Amsterdam Centraal station opened in 1889, right in the city centre, a stroll from most hotels. For a coffee, beer or meal before boarding the train to Berlin, try the beautifully retro Grand Cafe 1e Klas on platform 2B - look for the cockatoo on the bar. See Amsterdam station information. Deventer... As you cross the River IJssel at Deventer you'll see a film star. The white arched steel road bridge across the IJssel at Deventer just upstream from the rail bridge played the part of the famous John Frost Bridge at Arnhem in the 1976 film "A Bridge Too Far". You can see it in the distance in the photo above which was taken from the train. Coming from Amsterdam, it'll be on the right hand side two minutes before arrival at Deventer station. Coming from Berlin it'll be on the left hand side two minutes after leaving Deventer station. Kaiser Wilhelm Monument (above left). 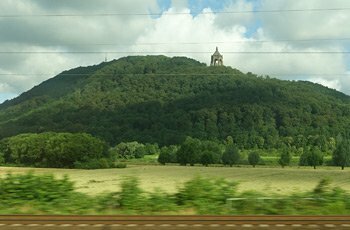 You pass the Kaiser Wilhelm monument on the left between Bad Oeynhausen & Minden when heading to Berlin, on the right when heading to Amsterdam. Erected in 1892-96 it's one of Germany's national monuments, see https://en.wikipedia.org/wiki/Emperor_William_Monument_(Porta_Westfalica). The original Volkswagen factory... The train calls at Wolfsburg, Volkswagen's worldwide headquarters. 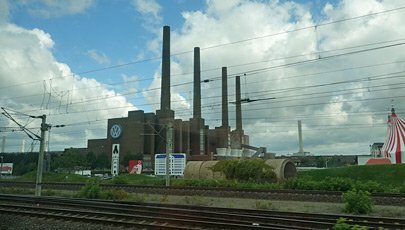 You'll see Volkswagen's original factory built in 1938 right next to the station on the left when heading to Berlin, on the right when heading to Amsterdam. The factory produced thousands of VW Beetles, as well as kubelwagens during the war. After swishing across the Netherlands and western Germany at up to 140km/h (87 mph) the train eventually joins the new high-speed line between Hanover and Berlin and accelerates up to 200km/h (125 mph). 2nd class is absolutely fine for most travellers, there's no need to go 1st class unless you don't mind the extra cost. The photo below shows the generous legroom for 6-footers even in 2nd class. But see what prices you get at www.bahn.de because sometimes 1st class doesn't cost much more. 1st class simply means more leg and elbow room and usually a quieter environment. You can pretty much take anything you like as long as you can carry it or pull it behind you. Nobody will weigh or measure it! 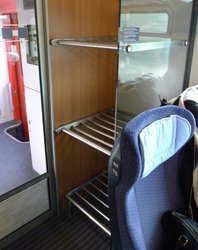 You take it with you onto the train, there's plenty of luggage space in both classes, the racks above your seat take anything up to backpack-size, the racks at the end of the car will take large suitcases, see the photo below. 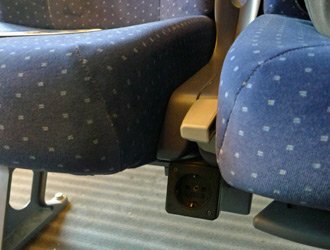 More information about luggage on European trains. A seat reservation is optional on this route. If you choose not to make one, you can sit in any unreserved seat - a small electronic display above each seat shows whether it is reserved or not. However, a seat reservation is a good idea especially on busy Fridays or around holiday periods. You can add a seat reservation when you book for a fee of around €4.50. 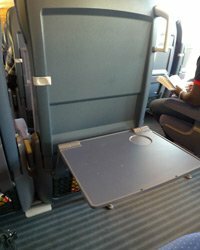 It's not possible to specify an exact seat or a seat facing direction of travel on these trains, but on www.bahn.de you can request a window or aisle seat, or a seat with a table (tisch in German), which means face-to-face seats at a fixed wooden table. All seats in fact have small drop-down tables. If you choose to reserve, the site asks if you prefer an open-plan saloon or a seat in a traditional 6-seater-compartment. 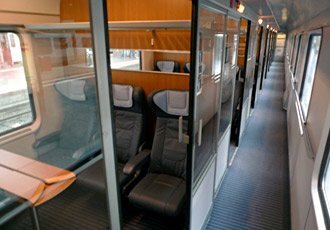 On these Berlin-Amsterdam trains there's one 1st class car with 6-seat compartments and a small 1st class section in half of the bistro car with a tiny open-plan section & two small 4-seat compartments. In 2nd class, almost all seating is in open-plan saloons which is probably the best choice, but in one coach there are a few 6-seater compartments which you might like if you are a small group or family of 5-6 persons. On your ticket it will say abteil for compartment, or grossraumwagen for open-plan car. Click here for a generic seat plan for a German intercity train. 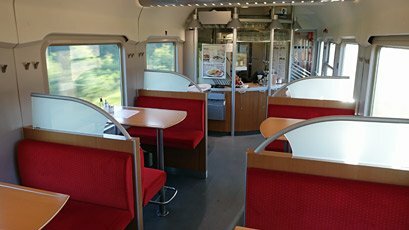 The 1st class car is usually a type Avmz, there's some 1st class seating in the bistro car which is type Arkimbz (but modernised, with seats 43-46 now unidirectional not a table for four), and 2nd class cars are type Bpmz or Bpmbz with one car usually being a Bvmsz. 1st class passengers can use the NS International lounge at Amsterdam Centraal and the DB lounge at Berlin Hauptbahnhof, with complimentary tea, coffee, juice and (in the DB lounge) wine & beer. 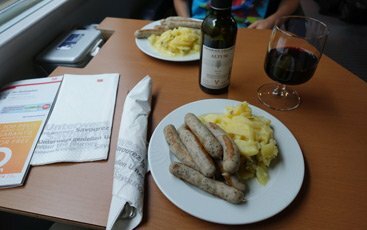 Although you can't use the DB Lounge in Berlin with a 1st class railpass or extra-cheap supersparpreis fare. See here for details. As with virtually all European trains, there's no check-in. Just stroll into the station, find your train and get on, any time before it leaves. The doors may be closed a minute before departure. At Berlin Hauptbahnhof, trains to Amsterdam use the east-west platforms above ground level, as opposed to the north-south lines below ground. ggf. freigeben - this is a last-minute reservation seat. You can sit in it if you like, but will have to move if someone shows up with a reservation. ggf. reserviert - this means the train's on-board reservation system hasn't been updated with the latest information from the main DB reservation system. Usually all of the seats show this message if this happens. Seat reservations are still valid, but cannot be shown on the LED displays, so you can sit in these seats but you could be asked to move if someone shows up with a reservation. bahn.comfort - travellers holding a frequent traveller BahnCard have priority for these seats. You can sit in these seats but someone with a BahnCard may show up and claim it. Though how they'd know you didn't have a BahnCard and so ask you to move is another question! Schwerbehinderte means that seat is reserved for people with disabilities. There are power sockets at all seats in both classes. Each car has at least one toilet. These trains have no WiFi, but there's good mobile data reception along most of the route. Bicycles can be taken on these trains, but bike spaces must be booked in advance by phone, bike spaces can't be booked online. Drop down tables and generous leg room for 6-footers, even in 2nd class! Plenty of luggage space - even on a busy train, in sight of your seats. A meal in the bistro car is a treat, see the sample menu below. Food and drink are served on proper china and in proper glassware, no airline plastic here. But if you prefer, you're free to bring your own food and even wine or beer along to consume at your seat.